Back in my 20’s I used to work in the beauty industry. It was something that represents me and my passion for beauty. It kept me looking forward to going to work everyday. Sometimes, when I think back.. I truly do miss those times. HOWEVER ~ ever since I open my eyes after I had tried Fabulash I have a whole new concept of feeling and looking amazing. Yup.. the below image us exactly how I look like with simply loose powder and lipstick as makeup. NO EYE MAKE UP AT ALL. I remember my very first Eyelash Extension done at a small beauty parlour many donkey years back left me with an experience that I can definitely STRESS was not a good one. There’s always horror stories and the fear that our real lashes will all drop off leaving us with *botak/bald* looking ones! 😖 When I had my first experience it was nothing more but horrible!! It was literally a nightmare that I told myself I will NEVER EVER get my lashes done ever again! Fast forward, many years, months and days later.. I stumbled upon the big RAVE of eyelash extensions once again. A girlfriend/neighbour of mine had hers done and I loved how it looked on her. 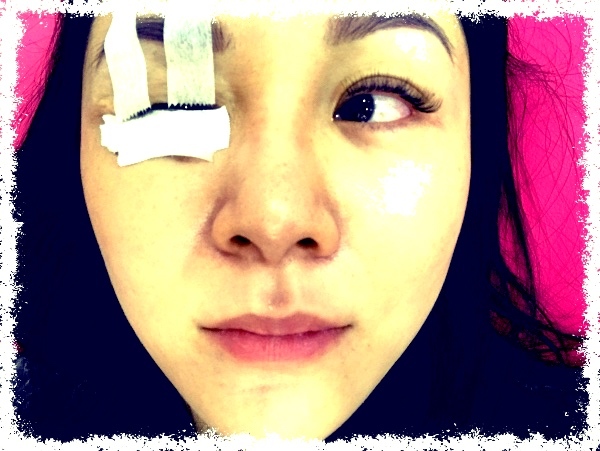 She had hers done in various places using ONLY JAPANESE LASHES! I was in dilemma. I started having the itch to try.. i wanted to give it a go but I was extremely fearful for loosing my lashes. Months later, my girlfriend moved to Singapore and I put the whole idea on hold. Until I heard about Fabulash located in Arcadia Desa Park City. They were opened for a good six months before I finally decided to walk in to enquire about it seeing how packed it always is whenever I walked past the shop. I finally made the leap and had my appointment set to get them lashes done! IT FELT LIKE A MAJOR TRANSFORMATION!!! The lashes I used were the Sakura Hime Lashes and they gave me a very natural look. They are also extremely light and doesn’t feel stressful at all on my own natural lashes. One thing I love is that their products are Japanese (YES! YOU CAN NEVER GO WRONG WITH JAPANESE PRODUCTS). As I am fairly active in general… gym in the mornings (I sweat a lot), run errands for the family and chase after my little monkeys + occasional Muay Thai in the evenings and late night social dancing.. I can say, these lashes doesn’t disrupt my daily lifestyle at all. If you’re like me… worried yet want to look fabulous.. take my advice and give Fabulash a chance to transform you to be beautiful. Fabulash does nails too! I love their collection of Nail Art available. They are simply GORGEOUS! Attached below are their prices as well as their contact information. Do give them a call to enjoy an amazing pampering experience from your lashes down to your toes.